Ukraine is a small open economy heavily relying on external trade. Exports of goods and services accounted for 50.2% of nominal GDP in 2010, while the ratio of imports to GDP was at 53.0%. Recently created Customs Union of Russia, Belarus and Kazakhstan (RBK CU) and the EU-27 are the largest trade partners of Ukraine. Together these two customs unions accounted for about two thirds of Ukraine’s total commodity trade turnover in 2010. Trade regimes between Ukraine and the EU, and Ukraine and the RBK CU are different. Trade with the EU occurs under the Most Favoured Nation (MFN) regime with tariff reductions provided by the EU in accordance with Generalized System of Preferences. In trade with Russia, Belarus and Kazakhstan, free trade agreements (FTAs) are in force for almost two decades. These agreements focus mostly on tariffs, and there are exemptions from free trade regime applied to selected commodities. 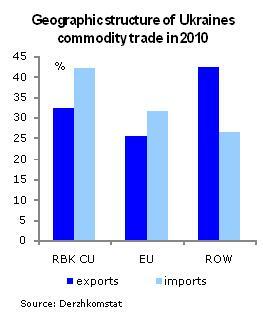 Non-tariff measures play important role in commodity trade with both the RBK CU and the EU. High importance of foreign trade for Ukraine’s economic development is highlighted by large reaction of real GDP growth to external trade shocks. Thus,the country should strive to ensure the best possible access of the Ukrainian exports to external markets and smooth supply of needed intermediary and investment products from abroad. The WTO membership is a step to achieve the goal. Regional integration could provide additional opportunities. While FTAs with Russia, Belarus and Kazakhstan are already in place, Ukraine is currently involved in active negotiations for a ‘deep and comprehensive free trade area’ with the EU. There have been sixteen rounds of talks since early 2008. Both parties claim significant progress, although important issues concerning energy sector and export tariffs remain unresolved. Nevertheless the FTA Agreement could be signed in the end of 2011. At the same time, Russia has pressed Ukraine to join the recently formed RBK CU and cease FTA talks with the EU and even threatened to increase trade barriers, if FTA agreement with the EU is concluded. Could this alternative be interesting for Ukraine? Let’s start from costs. First, Ukraine is a member of the WTO and, thus, made commitment to bound its import tariffs. The revision of these commitments is theoretically possible, but costly as other member countries have a right to request compensation or impose additional duties on Ukrainian goods to compensate for the losses caused by the change in commitments. The comparison of average import tariffs of the RBK CU and average bound tariffs of Ukraine shows significant difference. The rate of protection is higher in the RBK CU for thirteen out of sixteen sectors of the economy. Higher import tariffs in the RBK CU mean that Ukraine would face higher costs of imports in case of joining causing trade diversion towards Russia, Belarus, and Kazakhstan. Higher RBK CU tariffs for chemical products, machinery and equipment will make Ukraine to pay higher price for access to new technologies and innovative products from the rest of the world. Moreover, Ukraine as the WTO member is obliged to comply with the WTO Agreements, which became a part of the country’s legislation. At the same time, Russia, Belarus and Kazakhstan are just negotiating the WTO accession and thus are not bound by the WTO rules and norms. This disparity in legal basis creates additional obstacle in joining the RBK CU. The membership in the RBK CU is exclusive and Ukraine would lose its right to negotiate free trade agreements with other countries, including the EU FTA Agreement. Commission of the RBK CU is entitled to conduct new foreign trade related negotiations on behalf of the member states. Thus, Ukraine would forego all efforts devoted to the EU FTA talks and lose opportunity to obtain privileged access to largest regional market. 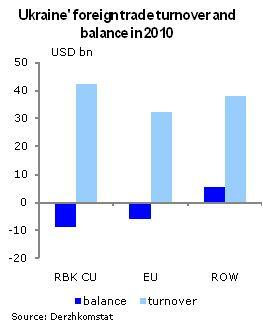 What could the RBK CU offer Ukraine to compensate these current and future losses? There are several possible advantages including cheaper energy, market access, and stronger bargaining power. First, opportunities to reduce price on imported energy materials are offered. However, stable long-term energy price discounts are highly questionable. Russia plans to deregulate internal market, and thus its domestic prices will go up. Moreover, world energy prices are soaring, and fossil fuels stocks are finite. Increase in energy efficiency and supply diversification is sounder economic strategy than a search for short-term price discounts. The second issue is market access. Ukraine already has signed free trade agreement with all countries – members of the RBK CU. Further gains received by elimination of exemptions are limited. Removal of customs control definitely creates additional gains, but similar gains could be achieved by ongoing Customs Service reform, if it reaches proclaimed goals. Moreover, in case of customs reforms, trade with all partners will be boosted, so no trade diversion effects will be observed. Finally, Russia offers Ukraine stronger bargaining position in future FTA talks if the country joins the CU. However, as the CU member Ukraine would face multi-stage bargaining process. It would need to balance its interests with interests of other members of the CU, and not only with interests of the third countries, involved in the FTA talks with the CU. It is questionable that resulting FTAs would be more beneficial to Ukraine. Summing up, the offered membership in the RBK CU is not in the economic interests of Ukraine. The country is geographically placed between two customs unions and actively trading with both. Thus Ukraine has to think twice before joining any of two. Currently, the best regional integration option for Ukraine is the establishment of mutually beneficial FTA with its trade partners. This type of integration offers vast opportunities that should not be sacrificed for the sake of the single customs union.